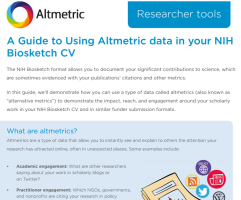 Handouts & guides – What Are Altmetrics? This guide provides tips for providing context and choosing appropriate metrics to include in your CV or resume. Attracting research funding is a key priority for many academics, but how do you make yourself stand out from the crowd? Metrics can help! This graphic gives an overview of the metrics that you might consider using in your next application. Altmetrics are real-time data that can help you understand who is talking about your research, how often they are discussing it, and what’s being said about it. 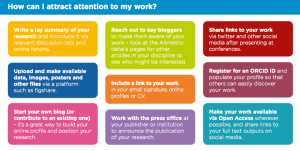 This guide documents three simple steps you can take to find altmetrics for your work or for research on a topic you’re interested in. These printable “cards” summarize a number of citation-based metrics, altmetrics categories, and their uses. Created by librarian Jenny Delasalle for Elsevier, this resource focuses mostly upon Elsevier-sourced metrics such as Impact Per Publication (IPP), Scimago Journal Rank (SJR), and Percentile Benchmarks for Scopus citations, Mendeley readership, and tweets. Here’s a guide that offers some top tips for making your research more discoverable – take a look and see which of the techniques would be most suitable for attracting the audiences you want to reach, and what you might be able to easily integrate into your existing workflows. Showcasing the value of your previous work to funders is becoming increasingly important. They want to see what the broader impacts of your research are, how you’ve engaged with different audiences, and to gather as much context as possible in relation to the grant you are applying for. Making use of Altmetric (and other) tools and selecting highlights to include in your personal summary can help support your case. Download this guide to find out more about why these kind of insights are likely to be of interest to your funder, how to find the data and some examples of what including it might look like.